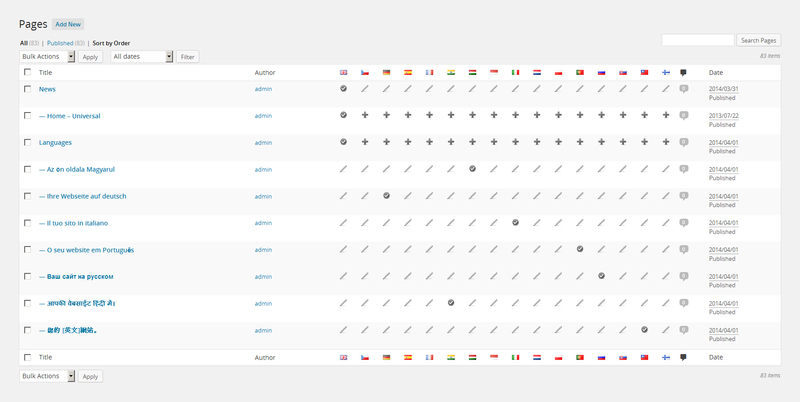 Built in Multilingual Support | Translated WordPress Themes to 18 languages. AIT Languages plugin allows you to create website in one or several languages. It extends our themes with multilingual functionality and what more it also includes 28 language translations. Your theme admin panel, page builder, custom post types, elements, widgets and settings will be translated into your own language. You can administer your website in your own language, no more hassle with PO files. You won’t need to do these translations on your own, everything is already translated and ready to use for you and your customers. All our WordPress themes are Multilingual right out of the box. Administration, Page Builder, Website Elements and Front-end parts are already translated to over 28 languages. You can have your website in one language or create a multilingual website. 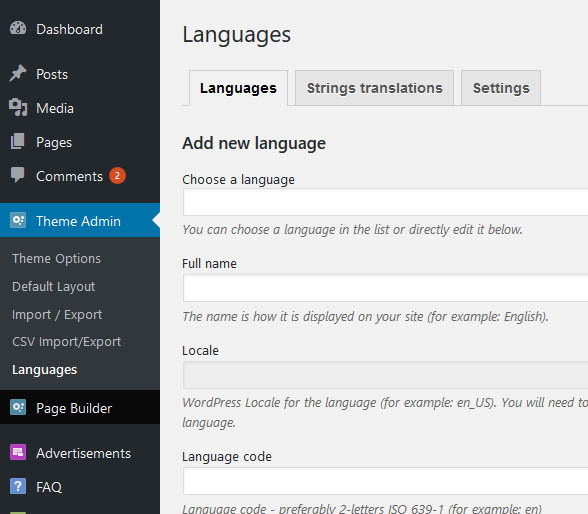 The First WordPress Themes already translated to over 28 languages. Everything is already translated. Just type in content in your language and it’s done. We have solved your problem with translations for good. You will never handle .po files or do the translation on your own. Most translations were make by professional translators. Languages marked as partly translated were made by community members. If you would like to help with the translations do not hesitate to contact us. All translations are already included in the theme package. 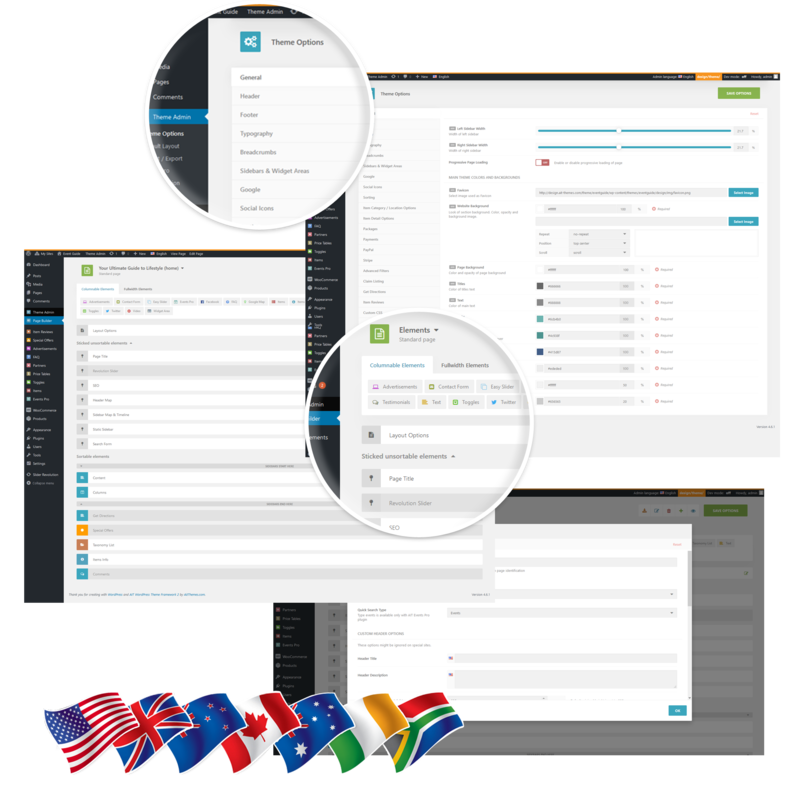 Themes come with built-in multilingual support, no 3rd party plugin is required. You can simply select your language and start building your website. 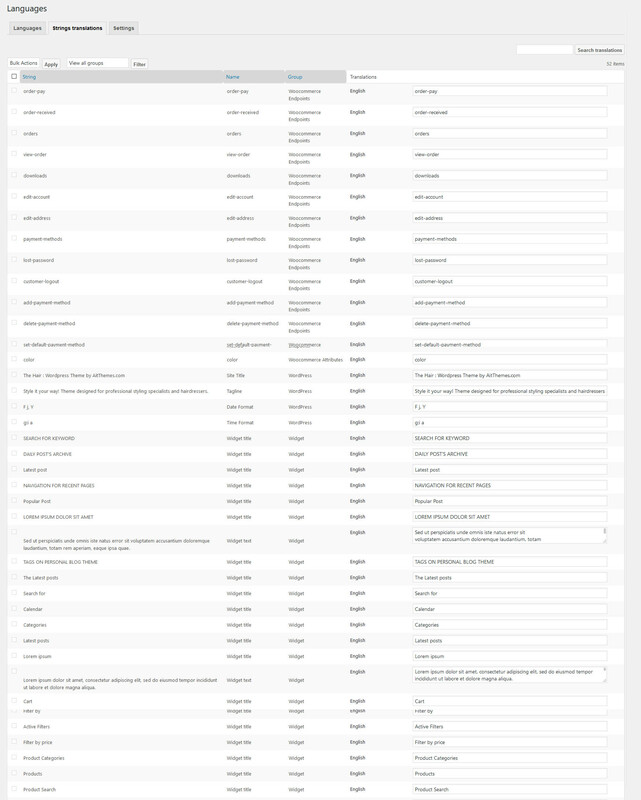 All parts of the theme and front-end are already translated to over 28 languages. Our themes currently support over 28 languages. We will constantly be adding more languages based on your requirements. If you don’t want to wait for a free translations you can add your own no problem by uploading PO file for your language. We use our WordPress Themes for our own clients. Translations were always the most time consuming and less creative task. Do you remember how you had to update your translations after theme update? We keep all our translations up to date with all theme updates. I’ve been using the Directory theme since 2014. The main version of the website is in German with a translation in English – the translation was created using WPML. Our new webmaster now installed Directory+ without being aware that the theme isn’t comaptible (anymore) with WPML – with the result that (most of) the English content is gone. A backup fortunately exists. I now saw that you offer a translation plugin on your own and I would like to know what approach you recommend to set up the site in German AND English without the necessity to create all the English content anew. The second option you have you should contact our support forum directly where our technicians are ready to help you in the most efficient way. I have bought the AIT LANGUAGES plugin for my website and it works as it expected except the string translations option. I would like to change some of the already translated texts into something more applicable to my website but cannot find a way to do that. Is there a way ? thanks for asking. Yes, AIT Languages plugin comes with the translations manage manually. It’s done via the crowing.com online application, and yet time to time we repair some translations based on feedbacks from our clients and improved translations are available within the newest version release. Thanks for understanding. One single question: the language selector can be shown WITHOUT country flags? Because I intend to create a web focused in several French-speaking countries, and isn’t polite to show the French flag to users from Belgium or Luxembourg or Uganda, for example. 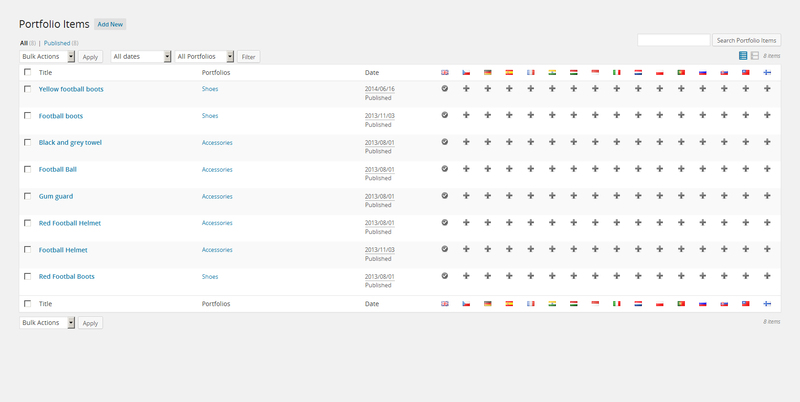 It will hide the flags and keep just names of languages on the site. I’m planning to use the AIT language plugin for a new wordpress site to come up. My theme is WP Spectrum that uses WP Bakery page builder. Will this plugin work with this theme? However I don’t like this theme for my new WP website moergeli.com. I prefer Spectrum. Therefore the question: Is it working with Spectrum? thanks for asking. 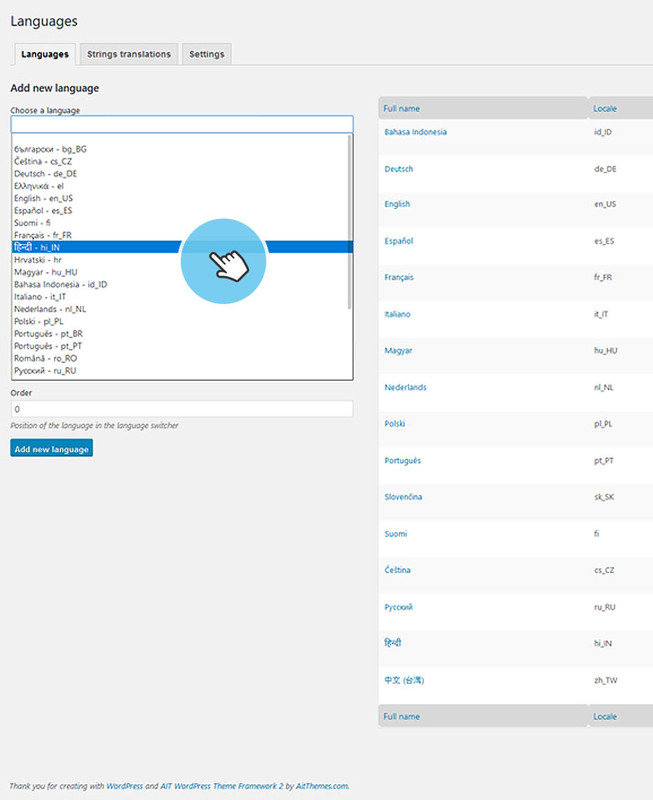 AIT Languages plugin comes compatible with the following themes only: https://www.ait-themes.club/wordpress-themes/#translated-multilingual-themes. Unfortunately the plugin can’t work with Spectrum theme. Does this plugin support proper Arabic translation? thanks for asking. We are sorry, Arabic language is not supported, RTL design is not support too unfortunately. Hello I need your help urgently.I installed your plugin on my website but the backend is now in German.How can I set it back to English. I’d like ask you to check our knowledge base and/or documentation https://www.ait-themes.club/documentation/ and filter the results by using the proper keyword. thanks for getting back on this and for your feedback. We are sorry for that there is only the following option how to manage permalinks/slugs: https://www.ait-themes.club/knowledge-base/how-can-i-change-items-slug-and-slug-of-other-custom-post-types/. Secondly, as our products are based on our Framework II they are not compatible with the most a 3rd party wordpress developers plugins. I do not find Norwegian among your supported languages. Any plans? thanks for asking. We are sorry, currently we have no plan to add Norwegian languages. I have a regular license for directory theme, and i would like to know if it’s possible to buy a multilanguage plugin that will allow me to display on the front end 2 or 3 languages with there specific url. We are very sorry, we have no Arabic language available by default and currently there is no plan to implemented it. It’ mostly due to the fact that we have no experiences with RTL design. Hi, guys i want to know i want to have a Business Directoy in 3 languages can you advice me what theme your plugin supports. or can you suggest me what them i can purchase. HI, i want to purchase a business directory theme in 3 languages spanish, french , English can you sugest me what themes support multiligual switching. please check out the answer posted a while ago. Hello. Does your auto-translation create new pages in a new language directory or does it overwrite the original language page? We are sorry, the content should be added manually per each page/item separately. how can I add the language selector on top of the page. thank you for asking. You should start adding your content in desired language and consequently the language selector appears.